In the Low Countries, the Feast of Epiphany, or Twelfth Night, is known as Driekoningen (Three Kings). The Christian holiday is traditionally celebrated on January 6th with a festive meal at which friends and relatives gathered to eat, drink, and be merry. Driekoningen originated as a medieval church holiday with public performances and festivals reenacting the biblical story of three kings or magi from the East who follow a bright star to find and do homage to the newborn King of the Jews. Their successful quest led to King Herod's decree to kill all boys under the age of two (Massacre of the Innocents) and to the Holy Family's flight into Egypt (Matthew 2.1–23) Although public performances had become outmoded in the 17th century, Twelfth Night continued to be celebrated in taverns and homes. Teniers captured the high point of Twelfth-Night festivities in his native Flanders, depicting the moment when the evening's newly crowned "King" raises his beer tankard while the "members of his court," including the jester, salute him with shouts of "the king drinks!" The king was chosen by chance, either by finding a bean or a coin in a cake baked for the occasion or by lottery, as is evident here from the two slips of paper on the floor and the one stuck on the hat of the young man seated at back. The king's paper crown was often decorated with images of the Virgin and Child, Joseph, and the Three Kings. In Peasants Celebrating Twelfth Night, Teniers effectively used the architectural elements of the tavern to reinforce his pictorial narrative and to isolate the main group of celebrants against plain plaster walls in a corner. Despite the relatively sparse interior of this humble inn, the good-natured joviality of the company marveling at the drinking prowess of the young king gives the scene great warmth. This beautifully executed work is the earliest known of the large number of representations of Twelfth Night in 17th-century Dutch and Flemish painting. With this panel, Teniers established the thematic prototypes that frequently recur in his own work, as well as in later paintings by other interpreters of this holiday. 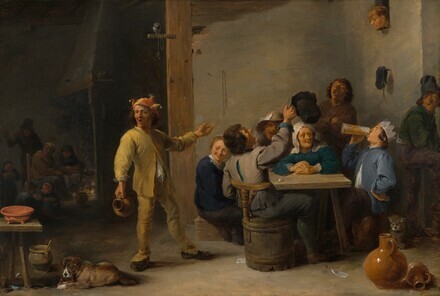 His characterizations of the celebrants are particularly masterful: the jaunty jester calling attention to the king chugging down his beer at the far end of the table; the warm-hearted, admiring gaze of the older woman in a blue jacket and white headscarf; the boy peering through the opening in the wall; and the drunken guffaw of the large-nosed lout at right who turns away from the urine bucket he has just helped fill. In the dimly lit background, a woman bakes pancakes, the traditional Twelfth Night fare. As she sits before the open fire and converses with a man holding a pipe, nearby children enjoy the fruits of her labor. The subject of Twelfth Night was appealing not only for its narrative possibilities, but also for its moralizing ones. Chance, after all, determined the selection of one individual to be king, one whose rule would last but a fleeting day. The owl on its perch, representing the ability to distinguish between what is true and what is not, is ignored by the temporary king and his courtiers. Perhaps illustrating the Dutch proverb that "not all fools wear a fool's cap," Teniers draws attention to the foibles of the boisterous group by emphasizing the jester through his stance and through his vivid red and yellow fool's cap. Teniers, one of the most prolific Flemish artists, painted a wide range of subjects but is best known for representations of peasant life, of which this work—with the artist's firm modeling and careful control of lighting effects—is a beautiful example. Teniers probably began his career in the studio of his father David Teniers the Elder (1582–1649), who was a painter of small-scale history paintings. Upon entering Antwerp's Saint Luke's Guild in 1632/1633 he began to specialize in low-life genre scenes in a style derived from the work of Adriaen Brouwer (1605/1606–1638), a Haarlem artist who had moved to Antwerp in the early 1630s. Teniers, who was incredibly versatile, also painted subjects that range from alchemists and witches to allegorical and biblical themes. He is famous, furthermore, for finely painted views of collectors' cabinets, many of which include portraits. Teniers developed a close personal as well as professional association with Peter Paul Rubens, and collaborated frequently with other painters as well. In 1645 and 1646, Teniers served as dean of the Antwerp artists' guild. Starting in 1647, Teniers entered the services of Archduke Leopold Wilhelm, governor of the Southern Netherlands, and was appointed official court painter in 1650. In these years he also worked for other European rulers, including Prince Willem II of Orange, Queen Christina of Sweden, and the exiled Prince Charles of England [the future Charles II]. Teniers, who seems to have retired from court life in 1659, purchased a country house in 1662. He advocated for the establishment of an academy of painting in Antwerp, which eventually opened in 1665. He died in 1690, at the age of 79, after enjoying a lifetime of fame and popularity. lower left on table edge: D. TENIERS F 1635; reverse: E'd Ladd Betts, Esq. Edward Ladd Betts [d. 1695], England. M. Belinarde, 1785. Alfred and Jacques Pereire, Paris, by 1936; Mme. I. P[ereire]; (her sale, Galerie Jean Charpentier, Paris, 4 June 1937, no. 22, as Le Roi boit! ); Guy Stein. Baron Alex. Gendebien, Brussels, in 1937; consigned c. 1939 for Baron Robert Gendebien by Eric-Emil Lyndhurst, Brussels, to (Firma D. Katz, Dieren, The Netherlands); probably sold to (P. Smit van Gelder, Antwerp); sold to (J. Kalb); sold 12 February 1941 to (Goudstikker firm, Amsterdam); sold 11 December 1941 to Professor Hoffmann, Munich; Baron Robert Gendebien, Brussels, 1955. Eric-Emil Lyndhurst, Brussels, 1955. (Kunsthandel Gebr. Douwes, Amsterdam), 1955. (sale, Sotheby's, London, 10 July 1963, no. 42); Mrs. Pethick. Mrs. M. Polak, New York. (Kunsthandel Gebr. Douwes, Amsterdam), in 1964. Dr. Heinrich Becker, Dortmund, by 1967;(Schaeffer Galleries, New York); purchased 3 February 1972 by NGA. The painting is inscribed on the reverse "E'd Ladd Betts, Esq." This is probably Edward Betts, a famous English physician, who died on 27 April 1695. John Smith, A Catalogue Raisonné of the Works of the Most Eminent Dutch, Flemish and French Painters, 9 vols., London, 1929-1942: 3(1831):334, no. 276. The painting could possibly have been in the collection of the Pereire family in the nineteenth century. During that period two Pereire brothers, Emile (1800-1875) and Isaac (1806-1880), played essential roles in France by pioneering railway transport and making innovations in investment banking and credit procedures. They were major collectors and shared an elaborate mansion on the Faubourg Saint-Honoré, where the collection was displayed. It was largely dispersed at public sales in 1868 and 1872. Their descendants Alfred and Jacques Pereire lent the painting to a 1936 exhibition in Paris. The 1937 auction catalogue identifies the seller as "Madame I.P.," although she was known to be Madame Isaac Pereire. On the family and their collection, see: M. Castille, Les frères Pereire, Paris, 1961; W. Bürger, "Galerie de MM. Pereire," Gazette des Beaux-Arts XVI (1864): 193-213, 297-317; Francis Haskell, Rediscoveries in Art: Some Aspects of Taste, Fashion and Collecting in England and France, Ithaca, 1976: 83-86; Albert Boime, "Entrepreneurial Patronage in Nineteenth Century France," in Enterprise and Entrepreneurs in Nineteenth- and Twentieth-Century France, ed. Edward C. Carter II et al., Baltimore and London, 1976: 142-146; Les donateurs du Louvre, Paris, 1989: 289; Pierre Rosenberg, "La donation Pereire," La Revue du Louvre et des Musées de France 25, no. 4 (1975): 259. The 1964 Gebr. Douwes exhibition catalogue lists a Baron Alex. Gendebien as the owner of the painting in 1937. According to correspondence with the Inspectie Cultuurbezit of the Netherlands and copies of documents provided by the Dutch State Archives, a Baron Robert Gendebien owned the painting in 1939 and was involved in its restitution after it was confiscated during World War II (see note 5). The relationship between Alex. and Robert Gendebien, though obviously familial, is unclear. A note on Witt Library fiche no. 13.365 indicates that the painting was "stolen from Belgium, 1939/1945." Although the collection of Eric-Emil Lyndhurst, a Jewish collector and dealer, was confiscated by the Nazi Einstazstab Reichsleiter Rosenberg (ERR) in 1943, this painting does not appear on the list of his collection compiled at that time. According to his statement of 23 July 1948, "[S]ome months before the outbreak of war in 1939, [he] handed over to Mr. Nathan Katz (of the Firm D. Katz, Dieren) [the Teniers painting] belonging to Baron Robert Gendebien for sale." Lyndhurst learned from Katz that the painting had been taken by the Germans during the war. After passing through Katz, Smit van Gelder, the Nazi-controlled Goudstikker firm, Kalb, and Hoffmann (probably Heinrich Hoffmann [1885-1957], Adolf Hitler's photographer) the painting made its way into Hitler's possession. The records of the Munich Central Collecting Point indicate that after the war the painting was recovered at Alt Ausee and restituted to the Netherlands on 15 April 1946 (Munich property card #2588/Aussee 1932; Dutch Receipt for Cultural Objects No. 10a, item no. 34, copies in NGA curatorial files). The painting arrived in the Netherlands on 28 May 1946. Although it is unclear to whom the painting was returned by the Dutch authorities, Robert Gendebien was assumed to be the rightful owner and was involved in the restitution. After its return, he may have again put the painting on consignment to Lyndhurst, who, according to the 1964 Gebr. Douwes exhibition catalogue, was in possession of it in 1955. See the letter dated 9 December 1999 from the Inspectie Cultuurbezit of The Netherlands, and copies of documents from the Stichting Nederlands Kunstbezit, archive no. 267, sent 4 January 2000 by the Dutch State Archives, in NGA curatorial files. According to a handwritten notation on a photograph in the Rubenianum in Antwerp. The Sotheby's auction report lists the purchaser of the painting as a Mrs. Pethick. Her name, however, does not appear in any other provenance listing. Perhaps she was an agent for a dealer or private collector. According to the catalogue of the 1964 Gebr. Douwes exhibition. In a letter of 30 January 1985 from Mrs. H.S. Schaeffer of Schaeffer Galleries, Inc., in NGA curatorial files, Mrs. Polak is listed as living in Sarasota. See Fritz Rolf, Sammlung Becker, Dortmund, 1967: no. 86; in this entry the 1936 exhibition at the Pavillon de Marsan, which included the painting, is incorrectly listed as being at the Pavillon de Marsau in 1946. Exposition Rétrospective de la Vigne et le Vin dans l'Art, Musée des Arts Décoratifs, Pavillon de Marsan, Palais du Louvre, Paris, 1936, no. 87. Tentoonstelling van schilderijen en tekeningen, Kunsthandel Gebr. Douwes, Amsterdam, 1964, no. 24. Smith, John. A Catalogue Raisonné of the Works of the Most Eminent Dutch, Flemish and French Painters. 9 vols. London, 1829-1842: 3:(1831):334, no. 276. Fritz, Rolf. Sammlung Becker, I: Gemälde alter Meister. Dortmund, 1967: unpaginated, no. 86, repro. Walker, John. National Gallery of Art, Washington. Rev. ed. New York, 1984: 287, no. 377, color repro. Greindl, Edith, et. al. XVIIe siècle: l'Age d'Or de la peinture flamande. Brussels, 1989: 82, repr. Klinge, Margret. David Teniers the Younger: Paintings, Drawings. Exh. cat. Koninklijk Museum voor Schone Kunsten, Antwerp, 1991: 266, repro. Bauman, Guy C., and Walter A. Liedtke. Flemish Paintings in America: A Survey of Early Netherlandish and Flemish Paintings in the Public Collections of North America. Antwerp, 1992: 278-279, repro. Wagenberg-ter Hoeven, Anke A. van. "The Celebration of Twelfth Night in Netherlandish Art." Simiolus 22 (1993-1994): 78, repro. Wagenberg-ter Hoeven, Anke A. van. Het Driekoningenfeest--De uitheelding van een populair thema in de beeldende kunst van de zeventiende eeuw. Amsterdam, 1997: 95, 208, cat. 76, repro. Hand, John Oliver. National Gallery of Art: Master Paintings from the Collection. Washington and New York, 2004: 231, no. 184, color repro. Wheelock, Arthur K., Jr. Flemish Paintings of the Seventeenth Century. The Collections of the National Gallery of Art Systematic Catalogue. Washington, D.C., 2005: 239-242, color repro.